Bernard Dampt, is a land worker in his village like his parents… grandparents and great-grandparents. He could not figure out that he could be the last member of his family living from agriculture. In 1980, he decides to plant or buy grapevine in an attempt to guarantee his 3 boys future. Member of la Cave Coopérative Chablisienne, he produces his first grape crop in 1981 in the Vignoble de Chablis. In 1982, in the midst of the Chablis label crisis, he proceeds to new plantations always bearing in mind his boys future ! In 1985.. Éric, his eldest, joins him and becomes a winemaker of the Chablisienne producing his first crop in 1988. In 1987, they plant their first vine trunks in Tonnerre and this is how the Chardonnay stroke again around the village. In 1990 Emmanuel joins them to continue, together with the family the renovation of the vineyard, but he will choose to commercialize the ► Bourgogne Tonnerre in bottles which has so far been commercialized in wort/raw (in the wine cellar cooperative). 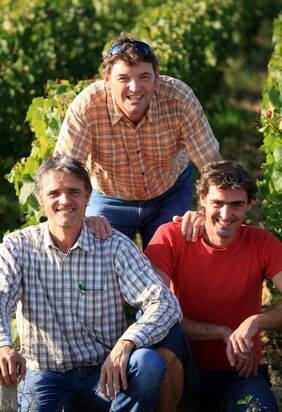 Each of Bernard, Éric and Emmanuel has his own vineyard, however they make all the decisions together. In 1991, the two brothers pooled their means through an integral CUMA which invests in various equipment such as high clearance tractor, wine press, vat wine making, vehicle for delivery and construction…. 1993… Bernard Dampt decides to retire and leaves the business to his sons. In 1998, Hervé Dampt joins his brothers and takes back his father’s old vineyard. In 2003, while the Domaine is in full growth, the first association of the Dampt brothers (Dampt Frères Earl) is created with their neighbor Jacky Poussière who is also a viticultural farmer.. The Earl Dampt-Dupas is founded in 2005 with Mme Dupas ; she mainly brings to the domaine the Chablis 1st Cru “Fourchaume” and the Grand Cru “Les Preuses”. In 2006, the wish to pool the workforce gave birth to the "Groupement d’Employeurs de la Grande Côte" of which every company is member. In 2009, Éric and Emmanuel have joined together to create one structure of marketing, "Vignoble DAMPT Frères". This one brought administrative simplification and commercial legibility. Today, we operate about 96 acres of vineyard in Tonnerre and Chablis, and sell every year about 700 000 bottles to a large range of customers (individuals, cellar men, restaurants, supermarket distribution, exportation to the United Kingdom, Italy, Japan, the Netherlands, Belgium, Ukraine, Russia, Ireland, Germany, Albania, Switzerland, the United States…). For the English version, thanks to Zeina KANDALAFT, Translator - Interpreter.